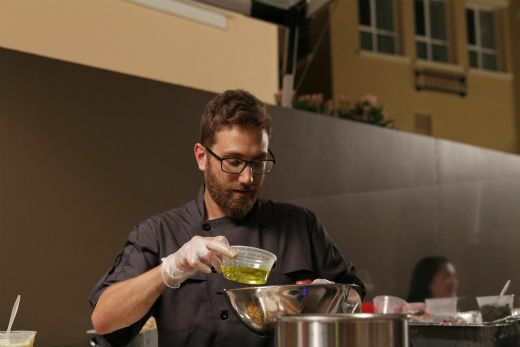 Phoenix local, Eric Gitenstein is one of the chef competitors in Robert Irvine’s show RESTAURANT EXPRESS premiering Sunday, November 3 at 9 p.m. ET/PT on Food Network. Nine chefs will have a chance to fulfill their lifelong dreams of launching a restaurant in Las Vegas, NV. The chefs will visit different cities and locations travelling aboard the Restaurant Express bus, competing in challenges that test their culinary skills and business savvy as potential restaurateurs. After each challenge Chef Robert Irvine will review their performances, with one chef being eliminated each episode. The final contestant standing wins an opportunity help launch and become the executive chef of a restaurant at the M Resort Spa Casino. Please see below for additional information. In White Plains, New York. Is the Mexican food, the great hiking, and quick drives to go snowboarding. Big Boi, City and Colour,”Killswitch, Engage, The Heavy, Buddy Guy, Rodrigo y Gabriella and whatever else I put on my running playlist. Has always been supportive. My brother Max is currently finishing his Masters in Oslo, Norway, but we always find time to talk. My parents have always championed us pursuing our dreams, and I’m lucky to have great in-laws ( and they’re lucky enough to eat my tasty food!). Jon Shook and Vinny Dotolo of Animal Restaurant. Exploring new restaurants, new cities, and even the right song. Every human and animal would have a home and support Boxer Luv Rescue (a local nonprofit)!! I love them and everything that they do. Sleeping in, followed by Bloody Mary’s and a BBQ/get together in 75 degree weather where I get to cook with all my friends and family that I don’t get to see as often as I like. Was a youth soccer league ref at age 14. I was the first kid soccer ref. to eject parent coaches for unsportsmanlike conduct. Let the kids be kids! Is going to the mountains to snowboard on a weekday after new snowfall, finding an untouched trail, and making the first tracks. Is now or never, I ain’t gonna live forever! Working on an adventure that will change me and my family for the better. Get the following dishes: Okonomiyaki from Hana Japanese Eatery, sweetbreads from Posh, any Torta from Doug Robson at either Otro Cafe or Gallo Blanco, any crepe from Crepe Bar, the Sonoran dog from Nogales Dogs on 20th St. and Indian school, the pork belly cubano from Bunk Sandwiches, or anything from Seoul Sausages in LA. Waste any part of an animal that has been slaughtered for food. It gave its life for your sustenance; show it respect by not wasting. “The best way to make your dreams come true is to wake up”- Muhammad Ali. I actually got to make him a custom meatloaf when I was the sous chef at Eddies House. Hopefully he liked it. Is to have my own successful restaurant, with such a great staff that I will be able to enjoy life with inside and outside of the kitchen. Are people who like local businesses on social media, but aren’t willing to go and spend their money there. Support the locals !